First, a little background. I have been using electronic media for engineering courses (Statics, Dynamics, Solid Mechanics, Fluid Mechanics) for over a decade here at Univ. of Oklahoma in the School of Aerospace and Mechanical Engineering. This causes a problem for exams if you have open book tests, as I do. How do you allow students to access electronic media with laptops while stopping them from accessing social media and other communication-capable websites? One solution that I have employed over the years is to monitor the student’s laptop screens from the back of the room during the exam. This requires a large classroom where I can walk behind them and they are seated in every other row. Neilson Hall 170 or Adams Hall 255 has worked well in the past. But it has become difficult to keep track of 60+ laptops in my classes even with two TA’s helping. Besides, the laptops are getting smaller and communication programs more sophisticated, making it hard to monitor. 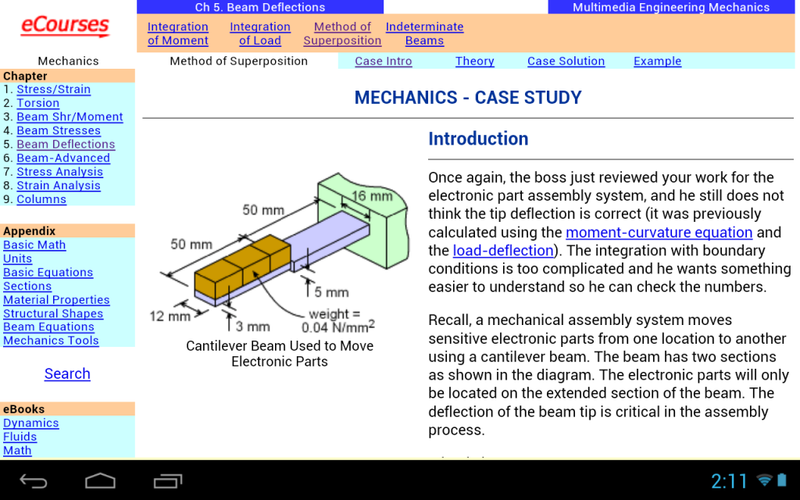 So, I decided in Fall 2013 to develop and implement a tablet-based testing system to be used for in-class testing. The tablets would need to fulfill several requirements to make it worthwhile to use. The main conditions would be 1) low cost (<$150), 2) lock out all apps not used for exam, 3) restrict internet access to only the eBook and WolframAlpha.com (used for computations), 4) have special exam app that reports back to eCourses.ou.edu, and 5) easy to maintain. When I started, I thought these conditions would pretty easy to meet and so I started preliminary development in November, 2013. I purchased three basic tablets, Dell Venue 7, Google Nexus 7 (generation 1) and Hisense Sero Pro 7. All were under $150. They all had good specifications for future use (1280×800 resolution, quad core CPU, 7 inch display, front and back camera, 1 gig RAM, 8 gig memory). Sorry, but iPad did not make the cut due to cost and it is difficulty in installing custom apps (Apple requires all apps to be installed only through iTunes). Next, I realized the tablets needed to be “rooted” so that I can remove most communication apps that are built in to the system. Rooting means the user (me) has full control of all files on the tablet which most manufactures do not want you to do. The Dell tablet could not be rooted, and so it was removed from consideration. The Google tablet did not allow the use of a SD card to load apps. In fact it had no SD card slot. I found that it was a great advantage to be able to load complete systems and apps from the SD card slot. So this eliminated Google Nexus 7. This left the the Hisense Sero Pro 7 which is sold exclusive by Walmart last year for $129. But, I was also able to purchase the same unit from NewEgg.com for $89 as a refurbished unit. I test a few refurbished units, and found they were great. So in the end, I was able to purchase 70 units for until about $6,300. This was very reasonable. Six months later and all 70 refurbished units are working just fine. The next task was to limit use of pre-installed apps like Facebook and Google Play. This required that I root the devices which were easy to do (details can be found on the Internet). By rooting the device, I could also install my own system interface which further restricted access to parts of the device. An important task was developing and implementing my own eBook app. I feel students should have access to all learning materials during an exam for reference. These means the eBook used in the class needs to be available on the tablet during exams. Originally, I was planning to use Firefox browser that allows access to the eCourses.ou.edu web site where the course eBook is located. After spending weeks trying to figure out how to lock down the Android Firefox browser (do not what students surfing the web), I concluded it was not realistically possible. After thinking about it some more, I decided it would not be hard to make a special app that only loads web paged from eCourses.ou.edu. In other words, use the built-in web page rendering engine inside Adobe Air programming framework, to pull in eCourses web pages. This worked great! The app can work on both Android and iOS (future). The whole app is only about 100 lines long. Below is a typical web page in the app. 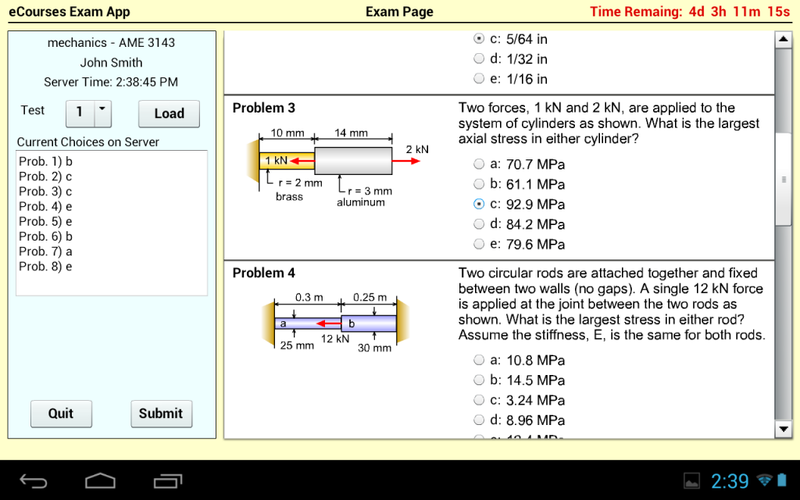 The main app, examApp, was needed for the student to take the exam. Previously, students would access the exam through a web page at eCourses.ou.edu. The development of examApp is too much for this blog entry, but I hope to have more details in another blog. In summary, the app was built using Adobe Air and FlashDevelop. Both are available without cost. The app accesses the class database on eCourses.ou.edu to check if the device and user are allowed. Then the student can access the exam through the app only during the exam time. The exam is taken in the class room. The tablets are handed out just before the exam and collected afterwards. However, all exam results are saved in the server database when the exam is taken. An example exam page is show below. The app is pretty simple, but did take effort to deliver the questions and graphics from the database. The programs are in different order for each student. The graphics are done in vector format (.swf) so that they look good at any resolution. There is a timer based on the server time so that the student can have an accurate notice of when the exam ends. The submit button is automatically turned off at the end of the exam. So far, the tablets and apps have been used for two exams in the Fall 2014 semester. Both exams went well and there were no technical problems with the app or the network in Neilson Hall 170. A final note about maintaining the tablets. Since all tablets are rooted, I can flash the devices with a new system that includes all apps (and removed apps) through the SD slot. This takes about 2-3 mins. So I can re-install all systems within 2 hours if needed. This allows me to remove any changes the student may have done to the tablet. Eventually, I would like to cut this time down to a few minutes for all tablets by doing it over the network, But I am not sure if that is even possible. I would like to thank the Stacy Zemke, University of Oklahoma Libraries and the Alternative Textbook Grants program at OU for funding the purchase of 27 of the tablets.